Honor, courage, resilience, emotional power: These have been keywords and concepts in our overarching discussion these last few months about how an individual can build the grit required to take on an overwhelmingly intimidating challenge like the attrition rate that knocks out 96% who aspire to wear the Navy SEAL Trident. One thing we know from experience and observation, successfully preparing any major challenge in life is far more than just being able to hammer out a lot of push-ups and pull-us. In this next series of blogs, I want introduce you to an integrated form of training that combines and aligns the mental toughness conditioning necessary to become unstoppable and also an uncommon person: it is called Warrior Yoga. 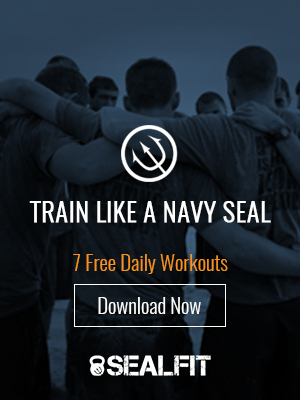 If are familiar with our training at SEALFIT and our Unbeatable Mind philosophy, this won’t be news to you. You’ll be aware that our form of yoga is a centerpiece of daily practice for excellence. If you’re new to our work, it may be necessary for you to first set aside any preconceptions you have about what yoga is. For one thing, it goes centuries deep and is far more than a stretching routine. Also, if you think yoga is for sissies, spend a little library time researching how the roots of yoga are intertwined with the martial arts and all warrior traditions. I explore these roots in my upcoming book titled Warrior Yoga. While there are numerous extensions and interpretations on what yoga is, and how to practice it, the foundational underpinnings form the oldest and most comprehensive personal development system known to mankind. In his work “Yoga Sutras,” Patanjali introduces us to eight primary practices of yoga. The following is an excerpt from my new book that illuminates some of the key points of these eight, interconnected levels of yoga training. Level 1: Ethical Disciplines, a code of morality and character to study, align with and ultimately live by. It can be viewed as a set of ethical disciplines to guide our interactions with other humans. We will discuss some of these later in the book, and they include a code of restraint, or balance; a code of non-violence; a code of truthfulness and honesty; a code of non-stealing; a code of non-coveting – meaning the elimination of greed and developing contentment with few possessions and non-indulgence. Level 2: Personal disciplines, individual disciplines taken on to set the foundation for mastery of your body and mind, leading to purity and contentment. They include: Detoxifying the body and the mind; a deep introspection and healthy use of mental capacities; also, a dedication to a spiritual practice (this can be attending your church, for example). For me, my spiritual practice is yoga and meditation. Level 3. Functional Movement. This level is what most Westerners think of when they think of yoga. The true purpose of this rung is to prepare the student’s body so that he or she can sit in concentration and meditation for long periods of time. For our purposes, this is the movement branch of Warrior Yoga. It includes the customary poses seen in many yoga studios, and also some functional movements from my SEALFIT program, or CrossFit and even the martial arts. Level 4. Breath Control. The fourth level is dedicated to the regulation of breath and harnessing the natural energy all around us. This level is where we begin to transcend from knowing yoga as a physical and ethical practice to experiencing a profound spiritual evolution. Working with the breath is free medicine, bringing optimal health and even great power. Yoga works with “prana,” or life force, through the breath. It is identical in this way to practices like Tai Chi (“chi” meaning life energy) and Qi Gong (“Life Energy Cultivation”). Through breath control practices like our Box Breathing drills, the energy centers of the body are tapped into, linked and energized through the conscious movement and control of the breath. Level 5. Mastery of the senses. From the extrasensory capacities developed by the deaf and blind, we know that by shutting off one sense, other senses will expand in extraordinary ways to compensate. Thus through level five we seek to train and regulate our senses. By mastering the senses, we can better control those random urges—think about what propels greed, and overeating—stuffing our garage with crap we don’t really need. By shutting off the senses we can sharpen our capacity to listen to the sixth sense, intuition. Level 6. Concentration, developing deep powers of concentration. We sharpen our mind and develop single-point focus. In practice, this is about brushing away the noise of the unruly mind by strengthening our capacity to lock onto one thing and block out the rest. Martial artists work binding their thoughts, laser-like, to movements. In Warrior Yoga we will use the poses, the breath and an object to concentrate on. Level 7. Meditation, developing singular presence. Where as concentration is a coherent, single thought, a state of meditation is the absence of thought, where you settle in your witnessing, perceiving mind. It is letting go of active thought and being in complete presence. It is at this level of yoga where deep levels of consciousness are obtained and further trained. In sports, this meditative state is known as the zone of peak performance, where time stands still and a flow state ensues. We seek to train ourselves to access this state at will through integrated training, specifically relying on this level of Dhyana. Level 8. Union, integration. This is considered to be the level of spiritual enlightenment, of the union of true self with the ego self. My friend Marc Gafni, co-founder with Ken Wilber of the Center for Integral Wisdom and author of Unique Self, explains that when enlightened, the true self (witnessing self) becomes the center of gravity of our consciousness versus the limited ego-self. We are then able to express our most authentic “Unique Self” to the world, and experience life as a blissful connection with others, versus separation. Again, this is the ultimate goal of Warrior Yoga. It’s a state of complete integration and access to our Unique Self and states of advanced consciousness and performance. By introducing Warrior Yoga to the world I am offering a unique perspective on this ancient system of development through sequencing that combine breathing, movements, meditations and visualizations designed for warriors and athletes to maximize their personal power, even though most of us are busy and already training in some form of fitness program. This program turns a mono-dimensional physical training regimen into a super-charged integrated training that accelerates personal growth. It does so by integrating and strengthening you physically, mentally, emotionally, intuitionally and spiritually. In the following blogs, we’ll look deeper in the toolbox of Warrior Yoga and how you can use it to achieve your goals of self-mastery in service.